This dark a deeply extracted Shiraz is a beautiful example of the quality coming from this winery. 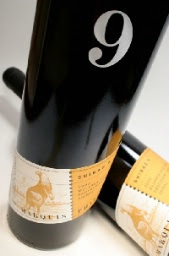 Chris Ringland has been the consulting winemaker since the departed Marquis' and has done a beautiful job in preserving the quality of the label. When first opened two nights ago this wine was so dense and extracted it was hard to taste. Now as the wine has been exposed to a good amount of oxygen it is displaying beautiful aromas of black licorice, vanilla, eucalyptus, cassis, and pencil shaving. The flavors are just as intense and complex showing massive cassis, licorice, vanilla, and rich chocolate notes. It's no wonder Robert Parker scored this wine 96-98 points because I would rate it almost a perfect Shiraz as well and give it 99 points. I love this wine and recommend it as a Shiraz "spiritual experience"!